Refrigerated containers are able to control temperatures, allowing every type of product (meat, fruits, vegetables, pharmaceuticals etc) to travel across the world. 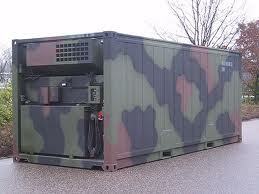 Reefer containers are available as 20ft and 40ft containers. 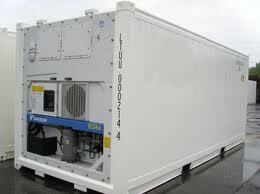 There are types of climate controlled containers which have an integral refrigeration unit to control the temperature inside the container. During the transportation, integral units are connected to the power system of the ship. The number of reefers which are allowed to be connected to the system depends on the capacity of the ship's power supply system. 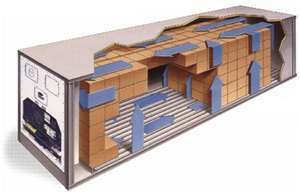 Interior air circulation in reefer container. The air flows through the container from bottom to top. The warm air is cooled in the refrigeration unit and then blown back as cold air. 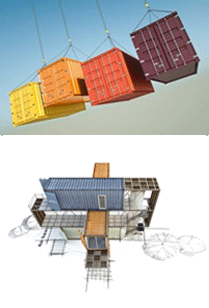 In the upper area of the container, there must be provided an adequate space for air flow. That's why the maximum load height must be marked on the side walls. Integral units must allow a controlled fresh air exchange (ex. : if they transport fruits, the removal of metabolic products such as CO2 and ethylene must be assured). In the refrigeration units, the air temperatures are measured and displayed to the outside of the refrigeration unit, so that they can be checked at any time. There are also the porthole containers which are insulated containers; they have no integral refrigeration unit and because of this, they have a larger internal volume. On board, the reefers are supplied with cold air by the central cooling system of the ship. The air flows through the container the same way as in integral units. Cold air is blown in at the bottom and the warm air is removed at the top. The doors represent a weak point in both integral units and porthole containers. In time, they can no longer close correctly, so they are no longer sealed. During transport of chilled and frozen goods, refrigeration capacity has to be increased to compensate the loss of cold air. Ultra-low temperature reefer containers can keep goods frozen at temperatures as low as -60°C. Other can preserve goods at warmer temperatures. They can ensure an optimal humidity inside and the atmosphere is well-controlled, so for example, bananas can be shipped between continents without turning brown. and fresh flowers can remain fresh even they travel for several days. At temperatures below -62°C, it is possible to transport or store food for an indefinite period, without loss of quality. Some products require changes in temperature during the transportation and the reefers with multi-temperatures system are needed in that case. The temperatures can be programmed at the beginning of the voyage. Refrigerated shipping containers can be modified to suit the clients requirements with extra-options including alarms, digital displays and special doors which enables easy access to goods.